Mary Faber is not enjoying life as an orphan fighting for her life on the streets of London. She dreams of adventure and discovers, with a change of clothing and some quick wit, she can get much further as a boy. And so she enlists as a ship’s boy on the HMS Dolphin. 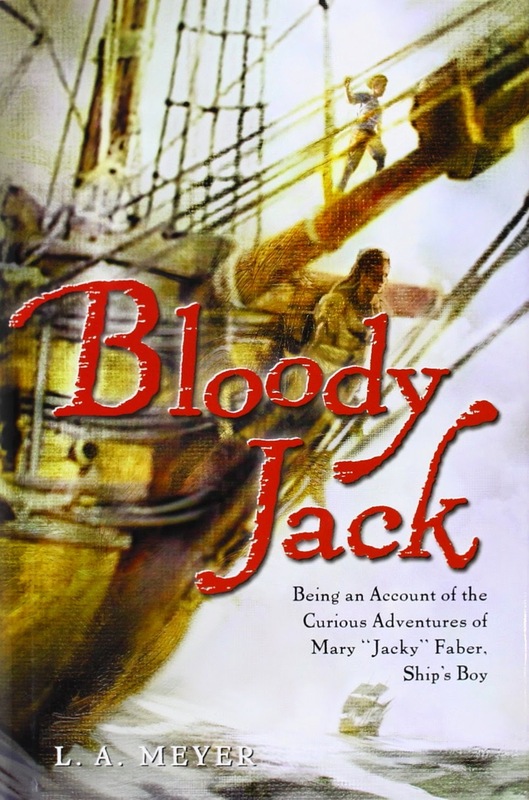 With a strong dose of courage, “Jacky” sets out to become a respected sailor amidst cutthroat pirates and dangerous shipmen. To be perfectly honest, I did enjoy this book. The story was exciting and Jacky is a most spirited, witty, and spunky character to read. Parts were a tad farfetched…but hey, why not? Why not be flown on a giant kite behind the ship? But I’m getting ahead of myself. Overall, yes, it is recommended. Will I read the rest of the books in the (very extensive) series? We’ll see. Now, just so you all know, this is an orphan girl living on a ship as she reaches that certain age of maturity (puberty!) and so your 11-year-old boy might not enjoy it so much. The girls, however, will probably find it as hilarious as I did. (Spoiler! She thinks she’s dying, haha).